Scylla about to Hurl a Rock, Etruscan, c. 4th century B.C.E., cast bronze, H.: 2 1/8 inches. Gift (by exchange) of Wilson Farnsworth, George Mead, and Henry Sheldon, 2015.251. 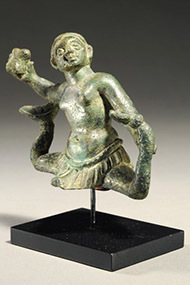 Since Scylla is Greek in origin and appears here in an Etruscan context, this statuette manifests a link between the Greek and Etruscan civilizations. Moreover, it depicts a mythological figure associated with a specific geographical location between Greece and Etruria: the Straits of Messina, the narrows separating Sicily from the Italian mainland. This solid-cast sculpture probably formed the finial of a cista, a tall Etruscan bronze box that held cosmetics and that was closed off by means of a domed lid.